The primary use of the funding was to attend the Measuring Behaviour conference at MMU including travel. 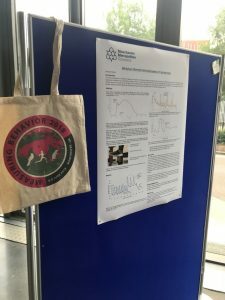 The conference was based around the study of human and animal behaviour, a day was also dedicated to sports engineering which gave an insight into how I could carry on my studies in this field. The event was multi-disciplinary with a variety of researchers, I attended many talks over the 3 days learning about software/hardware that is in development stages and asked could it be used in sports engineering once completed. It was a device designed to limit lumbar issues by alerting the user that they are in a ‘dangerous’ position throughout the day. On the sports engineering day I displayed my final year project poster concerning the degradation of running shoes, this got some interest as it was a novel method of testing that people hadn’t expected and changed the way they thought about how the shoes degrade through use. Some of the interest also started debates between couples saying “I told you so” to their partners. The most important thing about attending conferences is networking, many of the talks had very little relevance to my future career and some were extremely complex and hard to follow. During the breaks and events following the talks I began talking to an array of people, one of these people was asking me about my project and said they had a contact in industry who may be interested in my report and findings. Nothing came of it this time, but it might have, the more contacts and chances you have the more likely you are to find a career.